Biography of Italian Gothic Sculptor: Pisa Cathedral Pulpit. Detail of the Visitation Scene. The medieval Italian sculptor and architect, Nicola Pisano, was a highly innovative artist. Indeed it was his ability to assimilate different styles of art from classical Roman reliefs to French gothic sculpture that would result in the emergence of a new style of Gothic art  a style whose influence would be carried throughout Italy and act as an important precursor to later Italian Renaissance sculpture. His most famous works include the pulpits of Pisa and Siena Cathedrals. Pisano's origins and place of birth remain unclear - although he claimed to come from Pisa, where he spent most of his life, most historians now accept that he probably came from Apulia, a province in Southern Italy. It is also likely that he was taught the art of sculpture and the techniques of architecture, along medieval principles, in the same region. If he did begin his training in Apulia, it is likely that he was apprenticed to one of the numerous craftsmen that were employed by Emperor Frederick II to decorate his various properties and projects. Frederick's artistic tastes leaned towards those of ancient Rome, which he felt would project the right image as his own modern role as Roman emperor. (See: Romanesque architecture.) If however, Pisano left Apulia before he was apprenticed, he may very well have headed to Tuscany or Lombardy - there are strong influences of both regions in his style. Although no works can be definitely attributed to Pisano before 1259, it is said that he was summoned in 1221 by Frederick II to Naples to carry out some work on the new Castel del l'Uovo. If this is true, it would support the theory that he was apprenticed in the Apulia region. The earliest work which may be attributed to Pisano, is an exquisite relief sculpture of the Deposition from the Cross in the tympanum (side door) at the cathedral of San Martino in Lucca. The piece is dated about 1237. In 1259 Pisano was commissioned to work on the marble pulpit of Pisa Cathedral, and on the whole this is considered his finest work. His style developed and flourished as he worked on the pulpit - he amalgamated influences of the past - Roman reliefs, Christian motifs, mosaic decorations and French gothic influences - to create a new and dynamic artistic style. The style was energetic, grandiose, and gave a sense of direction to medieval art in Tuscany from 1260 onwards. The Pisa pulpit is a high octagon placed on semi-circular arches, supported by nine marble columns, three of which rest on marble lions. A complex work of Christian art, it is rich with sculpture and design, but still maintains a balance of simplicity. Pisano's later work, the pulpit at Siena, though beautiful, is generally considered less superior as it is overloaded with statuettes and reliefs. The main octagon of the Pisa pulpit depict five stories - the Nativity, the Adoration of the Magi, the Presentation in the Temple, and the Crucifixion. The figures are humane, emotionally expressive, yet retain a classical dignity. Some of Pisano's work here may have been influenced by Giovanni Pisano, his son and Fra Guglielmo and Arnolfo di Cambio - all apprentices in his workshop, who would go on to help him with the pulpit of Siena. The next important work of Pisano, was to decorate the Area di San Domenico, a church at Bologna which had been consecrated to that saint, who died in 1221. 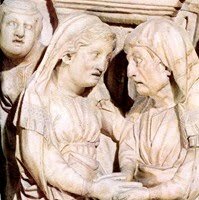 Pisano and his pupils worked on the sarcophagus, sculpting reliefs of the life of St Dominic. It was finished in 1267 by Pisano's pupils. In 1268 Pisano diverted his attention to the great pulpit of Siena Cathedral. Larger than the pulpit of Pisa, but of similar design, it was Pisano octagon in shape and supported on columns. In 1274, Nicola Pisano began work on a fountain in the piazza of Perugia Cathedral. Encompassing a series of basins, rising one above the other, each with a sculptured bas-relief, the fountain would be his last great sculpture. At Pisa, Pisano managed to combine classical and contemporary styles, but at Perugia, this uneasy relationship was tested. The 25-sided fountain mixes tales from classical Greek and Roman stories with contemporary liberal figures and characters. To learn how to judge artists like the medieval Italian sculptor Nicola Pisano, see: How to Appreciate Sculpture. As an architect, Pisarno was also celebrated in his time for saving the baptistery at Florence. The Florentines needed to destroy the great tower of Guardamorto, which overshadowed the baptistery but were fearful of damage. Employing engineering skills, Pisarno managed to pull down the tower, leaving the baptistery wholly untouched. Pisano died in 1278 in Pisa. He was succeeded by his son Giovanni, who would go on to be an eminent sculptor in his own right and would spread Pisanos new style throughout Tuscany and northern Italy.